Dallas Willard, Richard Foster, Eugene Peterson, and James Houston were early promoters of Spiritual Formation. In my research, I was surprised to learn that Spiritual Formation was around long before Richard Foster’s classic Celebration of Discipline (published in 1978). I am providing excerpts from an article by Chris Armstrong, which I found to be both insightful and shocking. Click here for the original source of the article. I have emphasized certain points by bolding and entered comments in [brackets]. Note – observe below how these four pioneers of Spiritual Formation spin the history of fundamentalism and “born again” evangelicalism to sound like something negative. There is no denying that by the time Foster’s Celebration hit bookstores in 1978, the conciliatory, culture-engaging “New Evangelicals” (represented by the National Association of Evangelicals [NAE], Christianity Today, and Fuller and Gordon-Conwell) had already begun to initiate themselves into the world of traditional Christian spirituality. They were using contemplative prayer techniques, attending retreats, sitting under spiritual directors, and reading Catholic and Orthodox books. Among the leaders of this movement to Christianity’s spiritual taproots we find four men: James Houston grew up Plymouth Brethren in England, taught for years at Oxford University, led in Intervarsity Christian Fellowship, and then in 1970 was called to Vancouver, British Columbia to become the founding principal of a new evangelical graduate school: Regent College. Eugene Peterson, raised Pentecostal, attended a holiness college and then served for decades as pastor of a Baltimore-area Presbyterian church before joining Houston at Regent and penning his famous Bible paraphrase, The Message. Dallas Willard, Southern Baptist by upbringing and ordination, trained in philosophy, has taught for decades in that field at the University of Southern California, and has written an acclaimed series of books on the spiritual life. Richard Foster took a new-minted doctorate from Fuller to the pastorate of a small evangelical Friends church in Southern California, where he met and was influenced by Willard, and now leads an interdenominational ministry in the area of spirituality. The movement represented by Foster’s Celebration was one of reaction. The fundamentalist movement of the 1920s–1950s had dedicated itself to defending important doctrines such as the divinity and personal return of Christ against liberal modifications. In so doing, it had come to identify the Christian life with cognitive belief. [Fundamentalism is more more than cognitive belief – it is the Truth of God’s Word.] What that meant, says Willard, is that “if you believe the right things, you go to heaven when you die—and in the meantime, there’s not much to do.” Discipleship, or growth in spiritual things, took a back seat. This was one seed of the “sanctification gap” in fundamentalism’s evangelical progeny. Second, there were the seemingly insurmountable barriers between Protestants and Roman Catholicism and Orthodoxy. Such explicitly Catholic practices as monasticism, spiritual direction, and contemplative prayer were beyond the pale for most mid-twentieth-century evangelicals. Almost all practices and beliefs that dated from before the Reformation— including all the great spiritual resources of the medieval and early churches—seemed somehow “Catholic,” too, though of course they are the heritage of all Christians 6 [but just because heresies are part of church history, does not mean born again Christians should take part in them]. A number of trends built bridges across denominations: First, in America’s increasingly mobile social environment, people were frequently meeting members of other denominations and thinking “These people are OK!” Second, the charismatic movement arose in the late 1950s, the Holy Spirit giving gifts that made it clear, as Willard puts it, that “I’m over here where you thought I was not.” Third, Billy Graham was unapologetically committed to working with all Christians. “He would be seen,” says Willard, “around the world preaching in all kinds of contexts, including Eastern Orthodox, and at first there was great criticism of him for doing this—even from the New Evangelicals.” His example, however, opened “a kind of practical ecumenism” among evangelicals—the upside of a breakdown of Protestant denominations whose effects we are still seeing today. The downside of this breakdown is that despite the anti-traditionalist tendencies of the old fundamentalists, their denominations had taught some helpful spiritual practices. “If you said, for example, in the 30s and 40s, that you were a Baptist,” says Foster, “it meant certain things about the way you approached the Bible—your study, evangelism, and so forth. You look back at the history read by Baptists—some of those great pietist people, Lottie Moon, David Brainerd, Jonathan Edwards—you’d read that stuff, and there was practice that these folks did in their lives.” Willard reminds us that the United Methodist Church still to this day has a Book of Discipline, enjoining such practices as Christian conference, Scripture memorization, and fasting. [I’m surprised that Foster and Willard did not mention George Fox’s Quaker mysticism here. In this blog, for example, both Foster and Willard laud Quaker mysticism – including Fox’s Inner Light heresy.] But increasingly, as denominations became less important in the life of individual Christians, the remnant of historical spirituality built into their structures was lost. In fact, the door to Catholic spirituality was opened for American Protestants by a number of events and influences. 1960 saw the election of America’s first Roman Catholic president. Vatican II opened the windows of ecumenical dialogue. Henri Nouwen came into the consciousness of lay evangelicals, opening up the desert tradition to them. The charismatic movement crossed confessional boundaries too. By the 1970s, evangelical Protestants began going on retreats at monasteries where they experienced Catholic spirituality on the ground. [Nazarenes have told me that their denomination was going on such retreats BEFORE 1970; I wonder how many additional denominations were going on these retreats before 1970.] They would come back refreshed, Willard remembers [so obviously Willard took part in these], and others would worry about their orthodoxy. An evangelical speaker at one of the movement’s better-known colleges [what speaker and what college?] exemplified the confusion: “Why are all these people going to Catholic monasteries,” he asked, “when we have all these good books here?” The truth was supposed to take care of everything. The trouble was, it did not. Of course, for most of us, experience has preceded definition. “People would experiment with solitude or silence,” says Willard, “and they would find themselves becoming less angry, or no longer contemptuous.” A quick check with the gospels would reveal these practical values, hidden there in plain sight. Discipleship, which for many evangelicals had meant nothing more than a certain kind of evangelism or Bible memorization [sorry to tell you this, Foster and company, this is true Christianity], would suddenly come into focus as “a way of living with Jesus so that the fruit of the spirit begin to work their way into our system” (Foster). Despite the popularity of such [primarily Catholic mystic] historical resources since the 1970s, the evangelical move toward spiritual ressourcement [Spiritual Formation] seems to have stalled out [supposedly]. Discipline requires, by definition, submission. Still marked by the antitraditionalism and pragmatism of their fundamentalist roots, evangelicals seem by and large unwilling to submit their spiritual growth to anything that looks like a mediating practice or tradition. They start from the assumption of unmediated access to the throne of God [this is no assumption – born again evangelicals DO have access to the throne of God via prayer] and rush ahead in fevered activism. Evangelical leadership is not helping. Foster observes that the ABCs of evangelical ministry are still “attendance, buildings, and cash” [does Foster really believe that is all that evangelicals are doing?] rather than the basics of discipleship [Spiritual Formation]. True, many evangelicals have been opened to the riches of Christian spiritual tradition, but we have barely scratched the surface. At its heart, the failure seems one of theological formation. Evangelical theological education has in many ways, reflects Houston, “failed as an educative process for the soul.” Overwhelming the crucial impulse to spiritual formation has been the tendency of many evangelical seminarians to “play to the gallery of academia—seeking intellectual respectability.” [I disagree with this assessment – there are very few Christian colleges and seminaries today that are not teaching Spiritual Formation with its occultish contemplative prayer/contemplative spirituality practices.] In other words, modern evangelical seminaries are still engaged in the famous medieval debate between the mystic Bernard of Clairvaux and the scholastic Peter Abelard: “Is knowledge for knowledge’s sake or for the love of God?” The burden of their response seems to have fallen on Abelard’s side. The fault is not often that of the students. A syndrome of disconnection between theology and spirituality marks most seminary programs. Willard observes, “most of the programs of spiritual formation in evangelical seminaries remain outside the theology departments, marginalized from the mainstream of seminary life and thought.” As a result, although evangelical seminarians have dabbled in the “spiritual classics,” their theology has not caught up to their practice. Spiritual formation teachings have not been rooted in theological understandings about who God is and how we relate to him. Emblematic of this disconnect is the fact that the most notable champions of evangelical spiritual ressourcement have come from outside the theological guild. Foster and Peterson are pastors, Willard a philosopher, and Houston a geologist. We owe them much, but without theologians willing to embrace broader definitions [broader definitions? – there is only one definition] of “being saved”—definitions that go beyond “going to heaven” to the “living out” of a graced life on earth—spirituality would seem destined to languish, an orphan among the disciplines of our seminaries. 1 Richard Lovelace, “The Sanctification Gap,” Theology Today 29:4 (January, 1973): 363–369. 2 D. L. Moody, “The Gospel Awakening” (Chicago: Fairbanks and Palmer, 1885), 667. 3 See Nathan Hatch, Democratization of American Christianity (Yale University Press, 1991) and Richard Hofstadter, Anti-Intellectualism in American Life (Vintage, 1966). 4 See the Left Behind series by Tim LaHaye and Jerry B. Jenkins. 6 On the history of evangelicalism’s anti-Catholicism, see Mark Noll and Caroline Nystrom, Is the Reformation Over? : An Evangelical Assessment of Contemporary Roman Catholicism (Baker Academic, 2008). 7 D. H. Williams, “Similis et Dissimilis: Gauging our Expectations of the Early Fathers,” paper given at the Sixteenth Annual Wheaton Theology Conference, April 12–14, 2007. Note that this and other papers from the conference have been published in Ancient Faith for the Church’s Future, ed. Mark Husbands and Jeffrey P. Greenman (Downers Grove: IVP Academic, 2008). My brief review of that book may be found at http://www.christianitytoday.com/ch/booksandresources/reviews/alexandriawheaton.html. 8 Thomas Oden, After Modernity . . . What? (Grand Rapids, MI: Zondervan, 1992), 14. Update: I have made an attempt to “tone down” most of my blogs about Evangelical Friends/Quakers, to not be so hurtful to my many friends in the EFCI (and EFC-ER). Yet when I see what is going on, I still feel compelled to speak out. Read on. I stumbled across this interview with Spiritual Formation founder Richard Foster. I was especially interested in Foster’s connections with the Evangelical Friends, now the EFCI (Evangelical Friends Church International) denomination. I am providing some excerpts below, which provide further details concerning Foster’s early connections with Evangelical Friends. I am emphasizing some points by bolding, and inserting comments in [brackets]. Click here for the original article. Thirty-one years ago, not many evangelicals thought much of the “spiritual disciplines,” and when they did, they thought of them negatively—as one more form of works righteousness. That began to change substantially 30 years ago, with the publication of Celebration of Discipline by Richard Foster [in 1978]. This book, arguably more than any other, introduced evangelicals not only to the disciplines, but also to the wealth of spiritual formation writing from the medieval and ancient church. Today you are almost as likely to hear an evangelical talk about Thomas à Kempis’ The Imitation of Christ as Rick Warren’s The Purpose Driven Life. [Christianity Today] Senior managing editor Mark Galli sat down with Foster in his home in Colorado to talk about the genesis of his lifelong work in spiritual formation, and how the disciplines have shaped him personally. Let’s begin at the beginning of your spiritual formation: How did you become a Christian? What were the key influences in your early Christian faith? How did you start to become interested in spiritual formation in a more focused way? My first church out of [Fuller Seminary] was a Friends church in San Fernando Valley in Southern California, with between 55 and 80 people on Sunday mornings. Dallas Willard and his wife attended there—she was the organist, and he led singing. Dallas also taught classes at the church, material that eventually became The Divine Conspiracy. In that little church, when I taught, people might come, but when Dallas taught, they brought their tape recorders. And I did too! I cancelled all adult Sunday school classes when he taught. You were conceiving of pastoral work primarily as spiritual formation, which would have been pretty unusual at the time. God was gracious. We were there doing what we could do and fumbling around and learning and growing and teaching and trying it. All the stuff that later came out in Celebration of Discipline, we were doing it all. And we had really good experiences and we had failures, too. I tried to get the congregation to have experiences of fasting. I never was very good at that. People would always have headaches from caffeine withdrawal. I found it was much better for just a few of us to try things out and see what we learned and go from there. Writing has been a large part of your spiritual formation work. When did you first start writing for publication? Throughout the interview, Richard Foster treads lightly, conveniently failing to mention the occult, New Age-ish aspects of contemplative prayer/contemplative spirituality. He mentions the disciplines of fasting and of solitude, but hardly a word about contemplative prayer. I assume that, by the time this interview took place (2008), Foster had received a great deal of backlash regarding contemplative prayer practices. This could be why Foster skirted this issue in his interview. You will find that some of my blogs are password protected. Most of these blogs have to deal with very personal issues. For example, a list of individuals in the EFCI (Evangelical Friends Church International) who are promulgating Spiritual Formation. Some readers have gotten very upset about these blogs, saying they have been hurt by my naming names. I feel this information is important to get out – yet I also understand this can cause hurt feelings. As a compromise for now, I have made these blogs password protected. To read password protected blogs on my blogsite, simply type “Password request” in the Comment box below (which is private), then hit “Post Comment”. I will write back to you with the password. Click here for my new blog on David Crowder’s book Praise Habit, in which he teaches occultish, contemplative Lectio Divina to young teens. 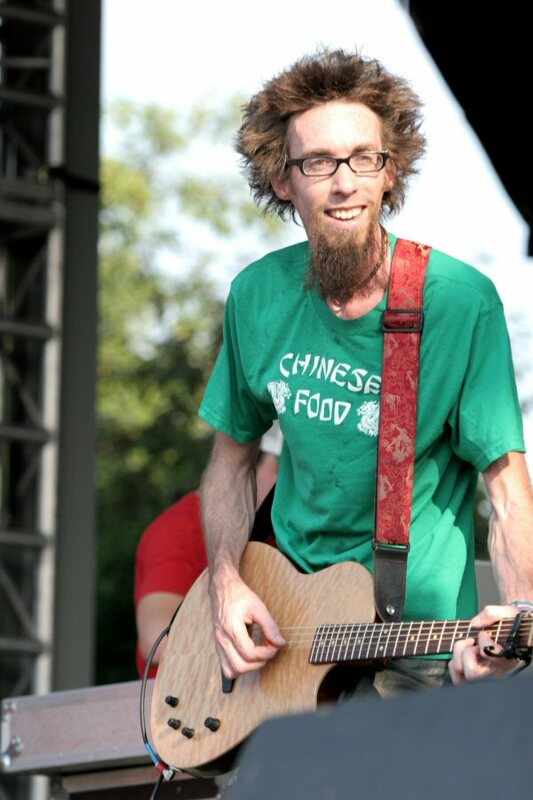 Here’s the skinny on the heretical Emergent David Crowder and his band. David Crowder played at Willoughby Hills Friends Church, in the EFC-ER (Evangelical Friends Church-Eastern Region), on 09/18/11. My question is WHY? Why did this heretical musician play there? Note – the following blog describes the Roman Catholic practices of David Crowder. But this is only the tip of Crowder’s destructive theological iceberg. Crowder is heavily promoting postmodern (Emerging/Emergent/Emergence) teachings. We can see this on his website, as well as in his participation at numerous postmodern events. Click here for the original critique, by Defending Contending, copied verbatim. I have emphasized certain points by bolding, and inserted comments in [brackets]. And now the latest pockmark to appear on the already scarred face of CCM comes from one of evangelicalism’s favorite “worship leaders,” David Crowder of the David Crowder Band. Leonard Sweet, Chuck Fromm (founder of the event and of Worship Leader magazine), emerging leader Sally Morgenthaler, Brennan Manning proponent Michael W. Smith . . . contemplative/emerging Marva Dawn, Alpha Course leader and contemplative proponent Todd Hunter, and others. Our entire ministry is dedicated to the Blessed Virgin Mary so that we may be led to the feet of her son with the obedience she exemplified. You are not Catholic, but on your “Illuminate” album, you sing a prayer of St. Francis of Assisi. What’s your connection? Much of the Catholic traditions and writings have been influential in my formation of faith and to be quite contradictory of what was stated earlier, I’ve found much inspiration there. St. Francis is a figure I’m equally attracted to and repelled by. I long for his powers of disassociation from the trappings of “stuff.” I’m beset with consumption and materialism, and he is a compelling symbol of contentment. His contentment and way of suffering terrify me. Let this be a warning fellow pilgrims, not all that glitters is gold, and not everything labeled “Christian,” that’s sold in “Christian” bookstores, and that’s played on “Christian” pop-music stations is what it’s purported to be. Be cautious that you are not influenced by those who’ve been influenced by Rome. Be careful little eyes what you see; be careful little ears what you hear; and always be sure to choose your entertainment wisely. I was a birthright Hicksite Quaker… We attended progressive Quaker schools such as Swarthmore College and George School. … I look forward to reading about this on your website. I was under the impression that the Emerging/Emergent church movements started in 1995. Not so – their roots date back as far as 1970. Check out the following blog posted by Discernment Research Group. The original post can be found here. “As far back as 1970, Larry Richards was calling for A New Face for the Church and in 1975 Howard Snyder pointed out The Problem with Wineskins. The student revolution of the 1960s marked the beginning of change in western society, and prescient believers were already discovering that the church would have to alter some of its structures in order to recast biblical community in the new world, still forming. The recommended changes of the ‘60s, however, had more to do with tweaking existing structures rather than calling the entire structure, right down to its foundation, into question. “In the last decade of the 20th century, a small group of Christian leaders were drawn together by their mutual conviction that evangelicalism had produced a subculture that was no longer the best possible representation of Christianity. The world that had given birth to North American evangelical institutions (established basically through the 1940s to the 1960s) had disappeared by 1990. These believers realized that pushing the same methodologies (perhaps even the idea of methodology) and striving to salvage the old worldview would increasingly alienate popular culture and future generations of Christian youth. “The group that met together to discuss these issues was fortunately blessed with astute and theologically informed thinkers like Brian McLaren and Tony Jones; ecclesiastical innovators like Todd Hunter, Chris Seay, and Brad Cecil; advocates of worship renewal like Sally Morgenthaler; and world-Christians like Andrew Jones. Scholars who had been discerning the times—Len Sweet, Stanley Grenz, N. T. Wright, Robert Webber, and Dallas Willard, to name a few—forged a biblical vocabulary that enabled the early team to converse intelligently on issues that were their passion. All of them shared two basic beliefs: western culture had radically changed since the 1950s, and the church desperately needed renovation to respond to cultural changes. “Well, back in the early 1990s there was an organization called Leadership Network funded by an individual in Texas, and Leadership Network was bringing together the leaders of megachurches around the country. By the early and mid-’90s, they noticed, though, that the kinds of people that were coming to their events were getting a year older every year, and there wasn’t a [group of] younger people filling in. They were one of the first major organizations to notice this. “They started realizing that there was a sentence that was being said by church leaders of all denominations across the country, and that was, “You know, we don’t have anybody between 18 and 35.” When they started paying attention to this increased dropout rate among young adults in church attendance, that opened up a discussion in the mid-’90s about Gen X. And so they starting bringing together young leaders in the Gen X category to talk about what was working in the church, what wasn’t working, what was going on. The Fundamentals or The Fundamentals: A Testimony To The Truth edited by A. C. Dixon and later by Reuben Archer Torrey is a set of 90 essays in 12 volumes published from 1910 to 1915 by the Bible Institute of Los Angeles. They were designed to affirm orthodox Protestant beliefs and defend against ideas deemed inimical to them. They are widely considered to be the foundation of the modern Fundamentalist movement. The essays were originally financed by Lyman Stewart in 1909 to set out what they believed to be the fundamentals of Christian faith. These were to be sent free to ministers, missionaries, Sunday School superintendents and others active in Christian ministry. 1. The Trinity: God is one “What” and three “Whos” with each “Who” possessing all the attributes of Deity and personality. 2. The Person of Jesus Christ: Jesus is 100% God and 100% man for all eternity. 3. The Second Coming: Jesus Christ is coming bodily to earth to rule and judge. 4. Salvation: It is by grace alone through faith alone in Christ alone. 5. The Scripture: It is entirely inerrant and sufficient for all Christian life. The 90 articles are available online in various places. I am pointing readers to this online source, rather than the Wikipedia list of articles. I assume the Wikipedia list is from an earlier edition of The Fundamentals. The “online article” website lists 90 articles in four volumes, while the Wikipedia list organizes the 90 articles in twelve volumes, in a different sequence. ^ Marsden, George M. (2006). Fundamentalism and American Culture. Oxford: Oxford University Press. p. 118. ISBN 0-19-530047-5. OCLC 61445933. ^ a b Malone, David (May 29, 2009). “Fundamentals”. Wheaton College Archives & Special Collections. Retrieved 2009-07-18. ^ Marsden, George M. (2006). Fundamentalism and American Culture. Oxford: Oxford University Press. p. 119. ISBN 0-19-530047-5. OCLC 61445933. Forster, Roger; Marston, Dr Paul (2001). “7 – Genesis Through History” (pdf). Reason Science and Faith. Chester, England. ISBN 1854244418. Retrieved 2009-03-24. Marsden, George M. (2006). “The Fundamentals”. Fundamentalism and American Culture. Oxford: Oxford University Press. pp. 118–123. ISBN 0-19-530047-5. OCLC 61445933.